In PDF, a color space is an important component of the current graphics state along with other drawing parameters such as stroking and filling colors, line width, and others. Versions of AspPDF.NET prior to 2.3 only supported RGB and CMYK color spaces via the PdfCanvas method SetColor/SetFillColor and SetColorCMYK/SetFillColorCMYK. These methods implicitly set the current color space to RGB and CMYK, respectively, and then specify the current color within this color space. As of Version 2.3, AspPDF.NET provides separate methods for specifying the current color space, and current color: SetColorSpace/SetFillColorSpace and SetColorEx/SetFillColorEx. This version also offers support for many more color spaces in addition to RGB and CMYK: Indexed, Lab, ICC-based, Separation, and others. NOTE: A detailed discussion of PDF color spaces is outside the scope of this user manual. Please refer to the Adobe PDF Reference for detailed information on this vast subject. To create an instance of the PdfColorSpace object, the PdfDocument method CreateColorSpace should be called. This method expects two arguments: the color space name, and an optional list of parameters. The valid color space names are: "DeviceRGB", "DeviceCMYK", "DeviceGray", "CalRGB", "CalGray", "Lab", "ICCBased", "Indexed", "Separation" and "DeviceN". When the newly created PdfColorSpace object represents a basic color space such as "DeviceRGB", no additional steps are required and the object is ready to be used. However, if the color space is an advanced one, some additional properties and/or methods need to be called on the PdfColorSpace object for it to be valid and complete, as shown below. For debugging purposes, the PdfColorSpace object exposes the property IsValid which returns True if this object is valid and complete, and False otherwise. The exact verbal reason for the object not being valid should be retrieved via the property ValidationError. Once a valid instance of the PdfColorSpace object is created, it can be used on the canvas of a page or graphics via the PdfCanvas methods SetColorSpace and SetFillColorSpace to set the new active color space for stroking and fill operations, respectively. Once a color space is made active, the current color within this color space should be specified via the methods SetColorEx and SetFillColorEx for stroking and fill operations, respectively. These methods expect a single argument, a PdfParam object or parameter string through which all color components c1, c2, ..., cN are specified. In addition to the use with the SetColorSpace and SetFillColorSpace methods of the PdfCanvas object, a color space object can also be assigned to an image via the method PdfImage.SetColorSpace. This sub-section describes all color spaces currently supported by AspPDF.NET, and the parameters and steps required to create a PdfColorSpace object representing each one. These device color spaces enable a page description to specify color values that are directly related to their representation on an output device. To create an RGB, CMYK or Grayscale device color space, the CreateColorSpace method must be called with the string "DeviceRGB", "DeviceCMYK", and "DeviceGray" as the first argument, respectively. The 2nd argument should be omitted as these color spaces require no additional parameters. No additional steps are necessary. The number of color components for these color spaces are 3, 4 and 1, respectively. Calibrated color in PDF is defined in terms of an international standard used in the graphic arts, television and printing industries. CIE-based color spaces enable a page description to specify color values in a way that is related to human visual perception. The CalGray color space (as well as CalRGB, Lab and ICCBased described below) is a CIE-based color space. It has a single color component. Xw, Yw, Zw (required) - the diffuse white point. Xw and Zx must be positive and Yw must be equal to 1. Xb, Yb, Zb (optional) - the diffuse black point. All three must be non-negative. (0, 0, 0) by default. Gamma (optional) - gamma for the gray component. Must be positive, generally greater or equal to 1. 1 by default. GammaR, GammaG, GammaB (optional) - gamma values for the red, green and blue components. All three must be positive. (1, 1, 1) by default. m1, m2, m3, ..., m9 (optional) - nine numbers specifying the linear interpretation of the decoded ABC components with respect to the final XYZ representation. Identity matrix (1, 0, 0, 0, 1, 0, 0, 0, 1) by default. amin, amax, bmin, bmax (optional) - 4 numbers specifying the range of valid values for the a* and b* components. (-100, 100, -100, 100) by default. N (required) - the number of color components in the ICC profile data. min1, max1, min2, max2, ..., minN, maxN (optional) - N pairs of numbers specifying the minimum and maximum valid values of the corresponding color components. Default values: (0, 1, 0, 1, ..., 0, 1). Additional steps must be taken to make an ICCBased color space object valid and complete. An actual color profile (usually a file with the extension .icc) must be assigned to the object via the method LoadDataFromFile. Many free color profiles can be downloaded from the Adobe web site. Optionally, an alternative color space for this ICCBased color space can be specified via the SetAltColorSpace method. Hival (required) - the maximum valid index value. Additional steps must be taken to make an Indexed color space object valid and complete. The base color space in which the values in the color table are to be interpreted needs to be specified, as well as the color table itself. Both are specified via the method SetIndexedParams. The first argument to this function is another instance of the PdfColorSpace object representing the base color space, and the 2nd argument a VARIANT-packed array of numbers. The size of the array should be (Hival + 1) times the number of color components in the base color space. A Separation color space provides a means for specifying separate (spot) colorants used in offset printing. Under this color space, a color is specified by a single numeric value in the range [0.0, 1.0] called a tint. To create a Separation color space, the CreateColorSpace method must be called with the string "Separation" as the first argument. The 2nd argument is not used. Additional steps must be taken to make a Separation color space object valid and complete. The name of the colorant that this color space is intended to represent needs to be specified. Also, an alternate color space and transformation function need to be specified to approximate the colorant on a device where the PDF document is viewed or printed in case the intended colorant is not available on that device. These three additional parameters are specified via the method SetSeparationParams. The first argument is a string containing the name of the colorant. The second argument is another instance of the PdfColorSpace representing the alternate color space. The third argument is an instance of the PdfFunction object representing the transformation function. Functions are described in detail in the next section of this chapter. In the example below, a Separation color space is created to represent the Pantone color 273. The alternate color space is DeviceRGB and transformation function performs a simple linear transformation from a tint value in the range [0.0, 1.0] to RGB values in the range [ (0, 0, 0), (56, 25, 122) ]. DeviceN color spaces can contain an arbitrary number of color components. They provide greater flexibility than is possible with standard device color spaces such as DeviceCMYK or with individual Separation color spaces. DeviceN color spaces are defined in a similar way to Separation color space - in fact, a Separation color space can be defined as a DeviceN color space with only one component. To create a DeviceN color space, the CreateColorSpace method must be called with the string "DeviceN" as the first argument. The 2nd argument is not used. Additional steps must be taken to make a DeviceN color space object valid and complete. A list of colorant names separated by the delimiter "##" needs to be specified. Also, an alternate color space and transformation function need to be specified to approximate the colorants on a device where the PDF document is viewed or printed in case the intended colorants are not available on that device. These three additional parameters are specified via the method SetSeparationParams. The transformation function passed to the SetSeparationParams method must have as many inputs as there are colorants in this color space. Optionally, additional information can be specified for each individual colorant via the method AddColorant. This method accepts three arguments: the name of the colorant, alternate color space and transformation function. These parameters describe the appearance of this particular colorant alone, while the parameters passed to SetSeparationParams describe the appearance of all its colorants in combination. The transformation function passed to the AddColorant method must have a single input. In the example above, we define a 2-colorant DeviceN color space based on Pantone colors 806-U and 273. The transformation function, which has 2 inputs and 3 outputs, is defined to convert color (0, 0) to RGB (0, 0, 0), color (1, 0) to RGB (255, 45, 142), color (0, 1) to (56, 25, 122), and, arbitrarily, color (1, 1) to RGB (128, 128, 128). Linear approximation is used for all colors in between. Example 2 extends Example 1 to include an individual transformation	function for each colorant. As shown above, some of the color spaces make use of functions, a special class of PDF objects representing numeric transformations from a set of input values to a set of output values. Each function definition includes a domain, the set of legal values for the input. Some types of functions also include a range, the set of legal values for the output. Input values passed to the function are clipped to the domain, and output values produced by the function are clipped to the range. A sampled function (type 0) uses a table of sample values to define the function. Values that fall between the sample values are interpolated. All color space examples in the previous section use sampled functions. An exponential interpolation function (type 2) defines a set of coefficients for an exponential function. A stitching function (type 3) is a combination of other functions, partitioned across a domain. A PostScript calculator function (type 4) uses operators from the PostScript language to describe an arithmetic expression. As of Version 2.3, AspPDF.NET provides support for PDF functions via the PdfFunction object. NOTE: A detailed discussion of PDF functions is outside the scope of this user manual. Please refer to the Adobe PDF Reference for detailed information on this subject. In AspPDF.NET, PDF functions are represented by the PdfFunction object introduced in version 2.3. To create an instance of PdfFunction, the PdfDocument method CreateFunction should be called. This method expects a single argument, a PdfParam object or parameter string specifying the function type and various other properties for the function being created. Some function types require that additional steps be taken to make the PdfFunction object valid and complete, as described below. For debugging purposes, the PdfFunction object exposes the property IsValid which returns True if this object is valid and complete, and False otherwise. The exact verbal reason for the object not being valid should be retrieved via the property ValidationError. Type (required) - function type. Valid values: 0 (sampled function), 2 (exponential interpolation function), 3 (stitching function) and 4 (PostScript calculator). (required) - function domain. There should be m pairs of numbers specifying the minimum and maximum valid values for each input, where m is the number of input values for this function. (required for types 0 and 4) - function range. There should be n pairs of numbers specifying the minimum and maximum valid values for each output, where n is the number of output values for this function. This sub-section describes all function types in detail, and the parameters and steps required to create a PdfFunction object representing each one. Sampled (type 0) functions use a sequence of sample values to provide an approximation for functions whose domains and ranges are bounded. The samples are organized as an m-dimensional table in which each entry has n components. Size1, Size2, ..., Sizem (required) - the number of samples in each input dimension of the sample table. BitsPerSample (required) - the number of bits used to represent each sample. The valid values are 8, 16 and 32. Order (optional) - the order of interpolation between samples. Valid values are 1 (linear) and 3 (cubic). Default value: 1. (optional) - m pairs of numbers specifying the linear mapping of input values into the domain of the function's sample table. Default values: (0, Size1 - 1, 0, Size2 - 1, ..., 0, Sizem - 1). (optional) - n pairs of numbers specifying the linear mapping of sample values into the range appropriate for the function's output values. Default: same as the range values. For a given value of x, Interpolate calculates the y value on the line defined by the two points (xmin, ymin) and (xmax, ymax). In addition to specifying the parameters described above, the method SetSampleData must be called on the PdfFunction object to make it valid and complete. This method expects a single argument, a VARIANT-packed array of numbers. The array length should be n * Size1 * Size2 * ... * Sizem. For a function with multidimensional input (more than one input variable), the sample values in the first dimension vary fastest, and the values in the last dimension vary slowest. For example, for a function f(a, b, c), where a, b, and c vary from 0 to 9 in steps of 1, the sample values would appear in this order: f(0, 0, 0), f(1, 0, 0), ..., f(9, 0, 0), f(0, 1, 0), f(1, 1, 0), ..., f(9, 1, 0), f(0, 2, 0), f(1, 2, 0), ..., f(9, 9, 0), f(0, 0, 1), f(1, 0, 1), and so on. For a function with multidimensional output (more than one output value), the values are stored in the same order as in the range parameters. Please refer to the previous section of this chapter for more sampled function examples. 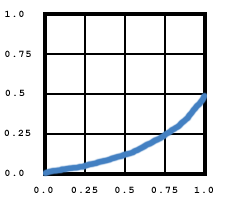 Exponential interpolation (type 2) functions define an exponential interpolation of one input and n output values. 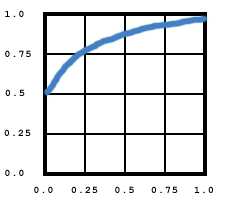 CZero1, CZero2, ..., CZeron (optional) - define the function result when x=0.0. Default values: (0, 0, ..., 0). 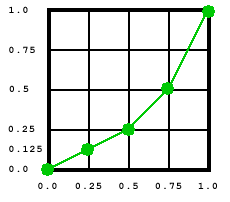 COne1, COne2, ..., COnen (optional) - define the function result when x=1.0. Default values: (1, 1, ..., 1). Stitching (type 3) functions define a stitching of the subdomains of several 1-input functions (referred to as "subfunctions" in this manual) to produce a single new 1-input function. This manual uses the letter k to denote the total number of subfunctions in this stitching function. Bounds1, Bounds2, ..., Bounds(k-1) (required) - a group of (k-1) numbers which, in combination with the domain parameters, define the intervals to which each subfunction applies. EncodeMin1, EncodeMax1, EncodeMin2, EncodeMax2, ..., EncodeMink, EncodeMaxk (required) - a group of k pairs of numbers which map each subset of the domain defined by the Domain and Bounds parameters to the domain of the corresponding subfunction. In addition to these parameters, the method AddFunction must be called on this PdfFunction object k times. This method expects a single argument, another instance of the PdfFunction object which represents a subfunction for this stitching function. The output dimensionality of all subfunctions must be the same and match the range parameters of this stitching function, if they are specified. x' = Interpolate( x, Boundsi-1, Boundsi, EncodeMini, EncodeMaxi) for i between 1 and k. In this equation, Bounds0 means Dmin1, and Boundsk means Dmax1. 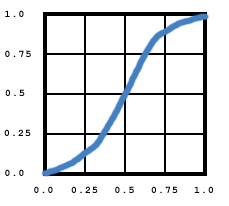 The following example combines two subfunctions, an exponential-interpolation one and a sampled one, into a single stitching function. Both subfunctions have the domains [0, 1]. The first subfunction is mapped to the subdomain [0, 0.5] of the main function, and the 2nd subfunction to the subdomain [0.5, 1]. A PostScript Calculator (type 4) function is defined as a text string of code written in a small subset of the PostScript language. The detailed description of the commands that can be used in a type 4 function is outside the scope of this manual. Please refer to the Adobe PDF Reference for more information. To create an instance of the PdfFunction object representing a type 4 function, the CreateFunction method must be called with the parameter Type=4, and the required domain and range parameters for each input and output values, as described above. There are no additional parameters. An additional step must be taken to make a PdfFunction object representing this type of function valid and complete. A text string containing the actual PostScript code must be specified via the property PostScript. This chapter would not be complete without a few PDF-generating C#/VB.NET lines of code. The following code sample displays an image in its default form as well as under an ICCBased color space. It also draws a series of bars under the default grayscale color space, a Separation color space with a sampled transformation function, and a calibrated grayscale color space. lblResult.Text = "Success! Download your PDF file <A HREF="+strFilename+">here</A>"
As of Version 2.7, the PdfTable object has been retrofitted to enable the border and background colors of a table to be specified in color spaces other than RGB (previous versions only allowed the table colors to be in the RGB color space.) To allow color spaces to be specified via PdfParam objects or parameter strings, the color space index, a unique integer identifier, is passed instead of an instance of the PdfColorSpace object. Two new methods have been added to enable arbitrary colors to be specified: PdfTable.SetColor and PdfCell.SetColor. The former can be used to specify the table border, table background, cell border and cell background colors for the entire table. The latter specifies the border and background colors for an individual cell. Type - specifies which color is to be modified. The valid values are: 1 (border color), 2 (cell border color), 3 (background color) and 4 (cell background color). The PdfTable.SetColor method allows all four values, while PdfCell.SetColor only allows values 2 and 4. ColorSpace - specifies the color space index. This value should be obtained from the Index property of the PdfColorSpace object. c1, c2, ..., cN - specify the individual color components for the color. These values must be in the range [0, 1] and the number of color components must match the color space being used. Top, Bottom, Left, Right - if set to True, specify which side(s) of the cell the specified border color should apply to. These parameters are only used by PdfCell.SetColor and only if Type=2. If none of these are set to True, the color applies to the entire cell border. Starting with Version 2.7, the ColorSpace and c1, c2, ..., cN parameters can also be used with the PdfCanvas.DrawText and PdfCell.AddText methods to specify text colors in color spaces other than RGB and CMYK.